I wasn’t even shopping for my New Orleans trip when I discovered this dress on Revolve last month, but the second I saw it I knew it would be perfect! 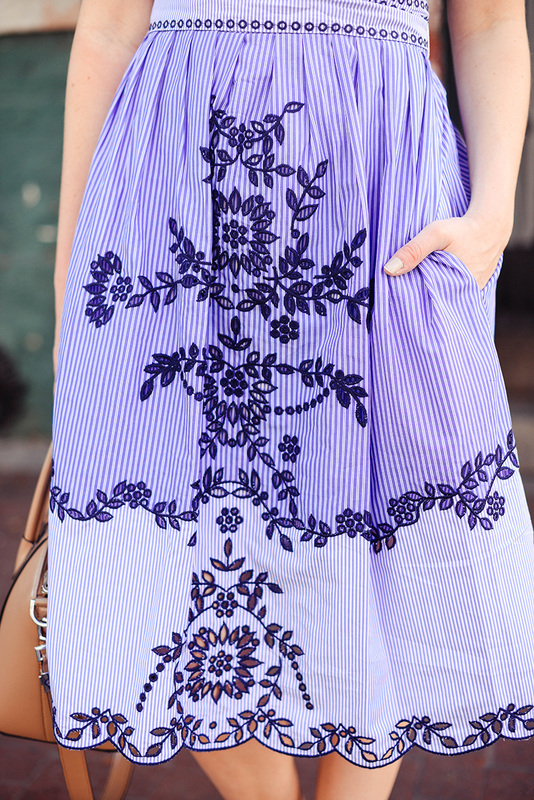 The dainty embroidery, pretty blue + white color scheme (stripes!) and flattering, modest silhouette exudes Southern charm, don’t you think? I wore this look my first day in NOLA for exploring the city with my sister. It was about 80 degrees and sunny that day, so this dress was the ideal option for walking around outside! It also has pockets, which was a great spot to put my phone since I kept pulling it out to snap pictures around town. No digging around in my purse trying to find it every five minutes! Unfortunately my dress is nearly sold out, but this shorter style features the exact same embroidery and print! The other midi dress you may have seen me in while I was in New Orleans is this Leith dress. It is SO comfortable and summer flattering. It also features pockets, is available in several solid colors, and is under $70! This bright striped number is so much fun! Love the color scheme. This Veronica Beard dress looks A LOT like the dress I’m wearing above. So cute and lightweight! This one-shoulder Mara Hoffman dress (featuring an oversized ruffle!!) is calling my name! Love the light lavender hue too. I love the subtle pinstripes on this off-the-shoulder number. Add a panama hat and some simple flat sandals to this dress and you’ve got a winning summer look. Effortless and chic! That dress is just stunning, you look gorgeous. This dress is so gorgeous! I love the details and color! Purple is your color! Love, love this dress on you! LOVE this dress on you, Merritt! So pretty! Love the seersucker and embroidered details! Such a beautiful dress! Love that color blue on you. What a gorgeous dress! I just love the color, detailing, and fit! That dress is so flattering! Simply perfect for New Orleans! I love love love your dress. You look great!